Xanathar's Guide to Everything + Merfolk vs. Goblins! 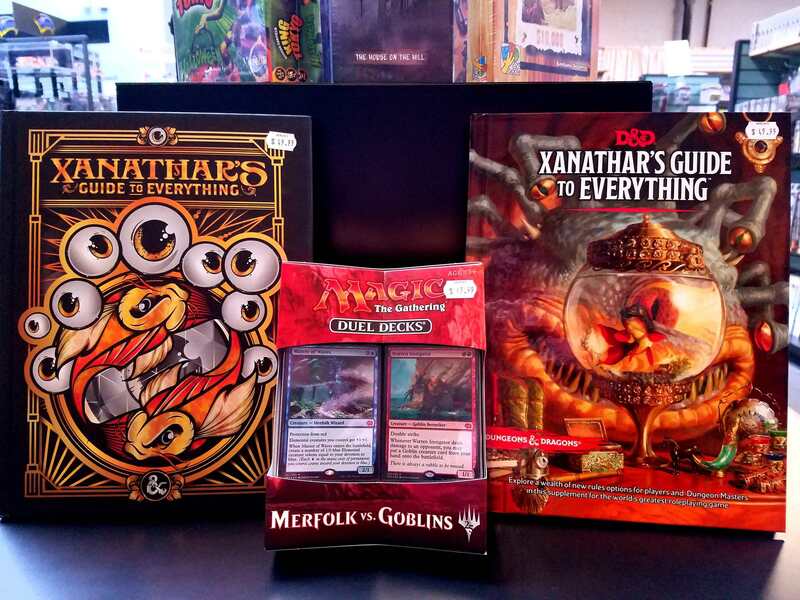 Posted: Sat Nov 11, 2017 5:47 am Post subject: Xanathar's Guide to Everything + Merfolk vs. Goblins! Wizards has dropped two awesome new releases this week and, here at Merlyn's, we're having a hard time containing our excitment! First up, we've got Xanathar's Guide to Everything; the highly-anticipated D&D 5th Edition supplement that adds a host of new rules and options for DMs and players alike including new traps, magic items, and over 25 new subclasses. Right now its available in both the regular cover and in an awesome black and gold Limited Edition cover, but those are sure to go fast! The other big Wizards release this week is the exciting new Duel Decks set: Merfolk vs. Goblins, featuring a foil Master of Waves and Warren Instigator, both with beautiful new art. Grab a friend and pit these two fun tribal decks against each other today!